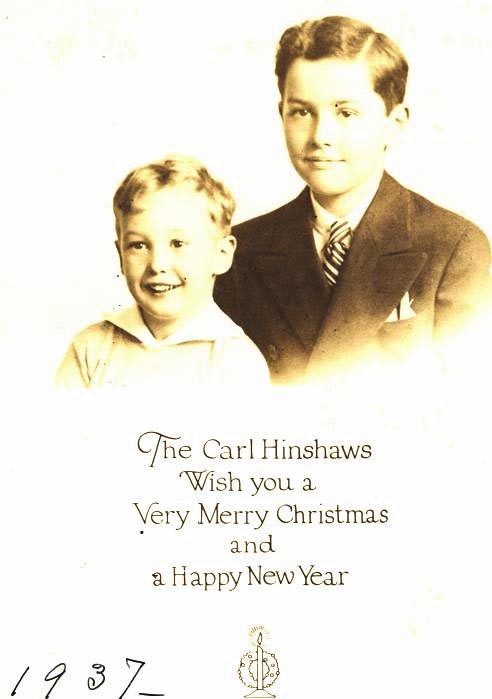 John Carl Williams Hinshaw1,7,8,9 [Carl Williams Hinshaw10,11,12]. 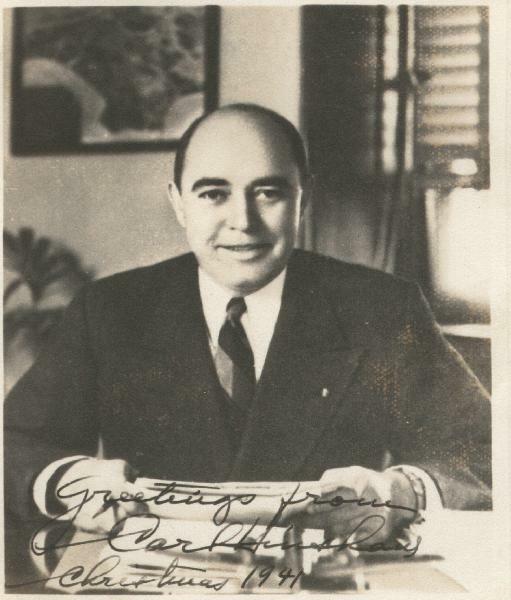 Hinshaw, Carl William, age 20, born Jul 28 1894, Chicago, Ill.; single; residence: Princeton, NJ. Williams, Carl P., head-of-household, born in Iowa; father born in Pennsylvania; mother born in Ireland; owned home; occupation: manufacturer, musical inst. Williams, El B., wife, age 41, born in Iowa; father born in New Jersey; mother born in Indiana. Williams, Bradley P., son, age 24, born in Illinois; parents born in Iowa; student. Williams, Faith, daughter, age 25, born in Illinois; parents born in Iowa; occupation: teacher, music. Randal, Albert W., nephew, age 28, born in Iowa; parents born in Iowa; single; occupation: manager, gen merchant. Hinshaw, JCW, nephew, age 25, born in Illinois; parents born in Iowa; single; occupation: engineer, railroad. 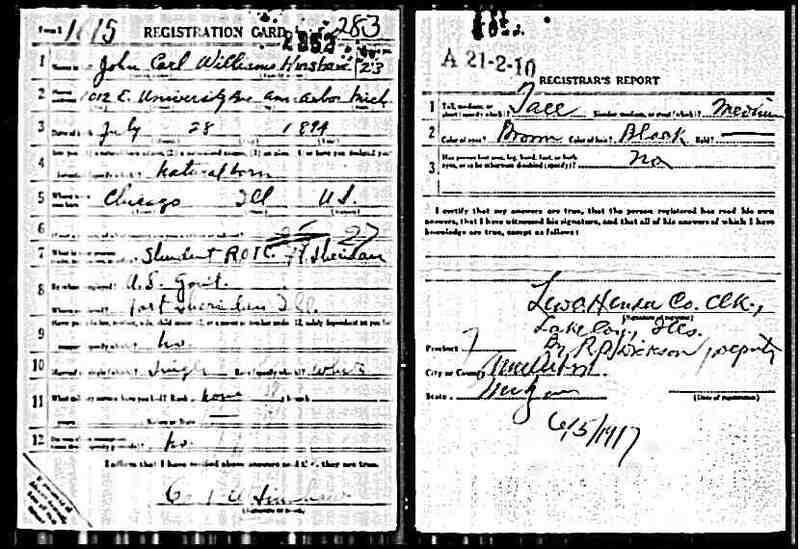 Hinshaw John C, head-of-household, age 35, born in Illinois; parents born in Iowa; widower, first married at age 29; owned home ($25000 value); no radio in home; occupation: broker, real estate; World War I veteran. Hinshaw John V, son, age 2, born in Illinois; parents born in Illinois. Hagman, Lilly A, housekeeper, age 41, born in Sweden; parents born in Sweden; immigrated 1905, alien; single; occupation: housekeeper, private family. Weirich, Elin T, nurse, age 56, born in Sweden; parents born in Sweden; immigrated 1892, naturalized; widow; occupation: nurse, private family. 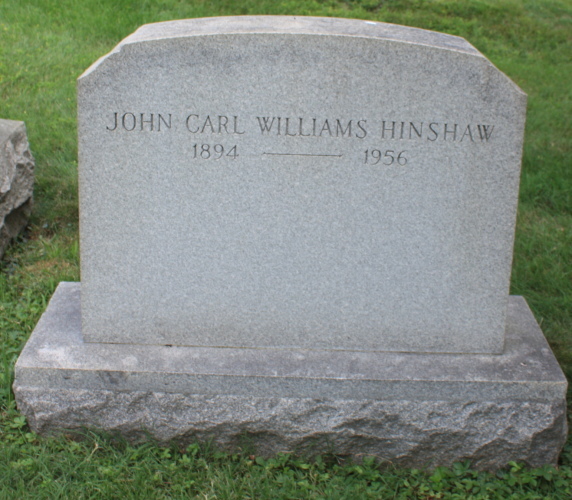 Hinshaw Carl (J.C.W. ), head-of-household, age 45, born in Illinois; completed 5 years of college; on Apr 1 1935 was living in the same place/town; owned home ($30,000 value); occupation: Member of Congress, U.S. Govt. ; worked 52 weeks in 1939; $5000+ wages in 1939, plus other income. Hinshaw Wilberta R., wife, age 32, born in New Jersey; completed 3 years of college; on Apr 1 1935 was living in the same place/town; worked 0 weeks in 1939; $0 wages in 1939, plus other income. Hinshaw John Veeder, son, age 12, born in Illinois; completed 5th grade; on Apr 1 1935 was living in the same place/town; attended school. 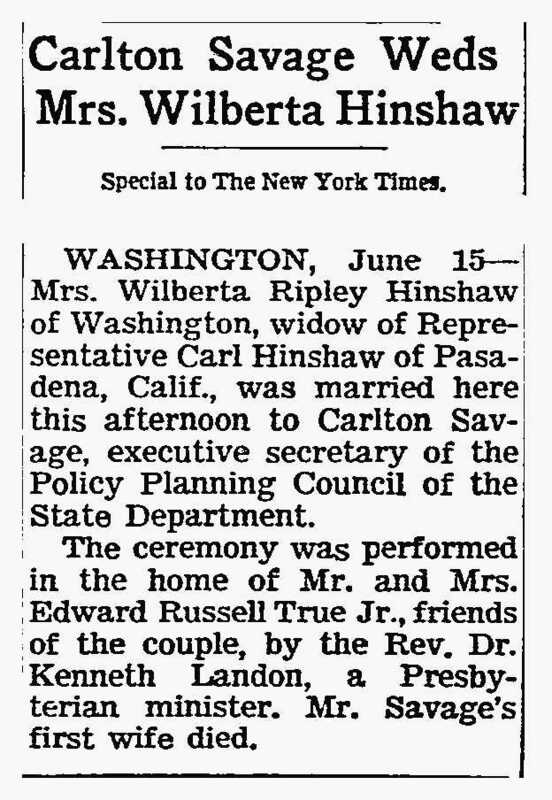 Hinshaw WD Ripley, son, age 5, born in California; on Apr 1 1935 was living in the same place/town. McBride Gladys, servant, age 31, born in Missouri; completed 4 years of high school; on Apr 1 1935 was living in the same place/town; widow; occupation: cook, private family; worked 52 weeks in 1939; $675 wages in 1939. Died. John Carl Williams Hinshaw, 62, Republican work horse on the House Interstate and Foreign Commerce Committee and the Joint Congressional Committee on Atomic Energy, authority on aviation; of pneumonia; in Bethesda, Md. 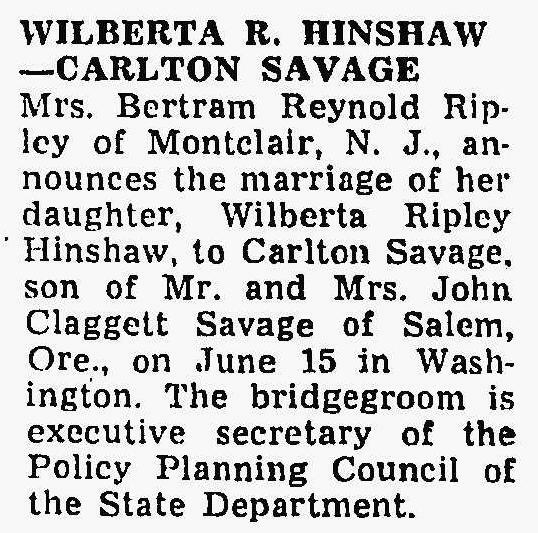 Wilberta remarried to Carlton Savage, Jun 15 1961, Washington, D.C.22 Wilberta's remarriage was reported in the "New York Times" (New York, New York) on Jun 16 1961,22 and in the "Washington Post" (Washington, D.C.) on Jun 18 196122 (see scans below). 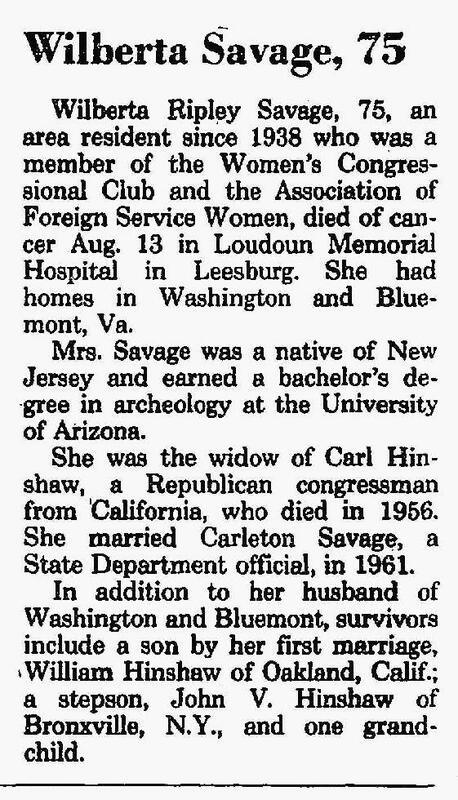 Wilberta's obituary was published in the "Washington Post" (Washington, D.C.) on Aug 15 198222 (see scan below). 1930 census, Pasadena, Pasadena Township, Los Angeles County, California; roll T626-169, ED 1250, page 5A, line #38, dwelling #116, family #116. 1940 census, East Pasadena, Pasadena Township, Los Angeles County, California; roll T627-244, ED 19-545, page 61A, line #23. Contribution from John V. Hinshaw Jr (). "Biographical Directory of the American Congress 1774-1949". 1900 census, 31st Ward, Chicago, Cook County, Illinois; roll T623-284, ED 956, page 17B, line #79, dwelling #206, family #289. 1910 census, Valparaiso, Center Township, Porter County, Indiana; roll T624-374, ED 138, page 1B, line #83, dwelling #22, family #22. 1920 census, Evanston, Cook County, Illinois; roll T625-358, ED 88, page 4A, line #2, dwelling #63, family #65. Photo courtesy of Jeffrey W. Hill (). Photo courtesy of Nicole Wing and John Veeder Hinshaw. Photo courtesy of Nicole Wing.